The doughnut is a fried ring or globule of sweet dough that is either yeast leavened or chemically leavened. The dough is mixed and shaped, dropped into hot oil and fried, and glazed. Jam-filled doughnuts are called bismarks. Batters vary and may be chocolate or lemon and include fruits such as blueberries, raisins, or nuts. Chemically-raised donuts are made with baking powder and are generally rather dense and cake-like. They are easily and quickly made. Yeast-raised doughnuts, which is leavened by the creation of carbon dioxide resulting from fermentation of yeast, are lighter in texture than chemically-raised doughnuts. They require several hours to produce. These sweet treats are easily made at home using basic ingredients and require no special equipment. Doughnuts are baked and sold on premises at small, privately run bakeries, grocery stores, and in franchise operations that offer a standard product through the use of a pre-packed mix and carefully-controlled production. Large commercial bakeries make thousands of dozens of doughnuts each day, packaging them for distribution across vast regions. Doughnuts are a beloved American snack. Children sing their praises in a song that begins "Oh I went downtown and walked around the block/I walked right into the doughnut shop…" Clark Gable taught Claudette Colbert how to dunk her doughnut in the classic 1934 movie "It Happened One Night." Many World War I and II veterans swear that doughnuts served in canteens got them through the roughest of times. Dough-nut franchises have flourished in the United States since the 1930s. Despite their fat content (at least 3 g) and calorie content (a minimum of 200), Americans alone consume 10 billion doughnuts each year. The doughnut supposedly came to us from the eighteenth century Dutch of New Amsterdam and were referred to as olykoeks, meaning oily cakes. In the nineteenth century, Elizabeth Gregory fried flavored dough with walnuts for her son Hanson Gregory, hence the name doughnut. By the late nineteenth century, the doughnut had a hole. Doughnuts were a great favorite at lumbering camps of the Midwest and Northwest as they were easy to make and full of calories needed to provide quick energy for arduous logging jobs. "Doughboys" of World War I ate thousands of doughnuts served up by the Salvation Army on the French front. Soldiers reminisced that the doughnut was far more than a hot snack. The doughnut represented all the men were fighting for—the safety and comfort of mother, hearth, and home. Soon after the doughboys returned, dough-nut shops flourished. A Russian immigrant named Levitt invented a doughnut machine in 1920 that automatically pushed dough into shaped rings. By 1925, the invention earned him $25 million a year and it was a fixture in bakeries across the country. The machine-made doughnut was a hit of the 1934 World's Fair. Other machinery quickly developed for everything from mixing to frying. Franchises soon followed. By 1937, Krispy Kreme was founded on a "secret recipe" for yeast-raised doughnuts and Dunkin' Donuts (currently the franchise that sells the most doughnuts worldwide) was founded in Massachusetts. Presently, Krispy Kreme totals 147 stores in 26 states, while Dunkin' Donuts has 5,000 franchises in the United States and is present in 37 countries. Ingredients vary depending on whether they are yeast or chemically leavened. Furthermore, homemade doughnuts generally include far few ingredients than mass- produced or those made from mixes. Chemically-raised doughnuts are made with ingredients such as flour, baking powder, salt, liquid, and varying amounts of eggs, milk, sugar, shortening and other flavorings. This type of doughnut uses baking powder in the batter to leaven the dough. Yeast-leavened doughnuts are made with ingredients that include flour, shortening, milk, sugar, salt, water, yeast, eggs or egg whites, and flavorings. Doughnuts produced in sanitary baking conditions in grocery stores, bakeries, or franchises often come from pre-packaged mixes. These vary but can include: flour (wheat and soy flour), shortening, sugar, egg yolks, milk solids, yeast dough conditioners, gum, and artificial flavors. One franchise adds a yeast brew. Mixes require the bakeries to add fresh wet ingredients such as water, milk, and eggs in the mixing process. Doughnuts also require oil (usually vegetable oil) for frying. Glazes or frostings are often added after the product is fried and are made with flour, sugar, flavoring, and sometimes shortening. 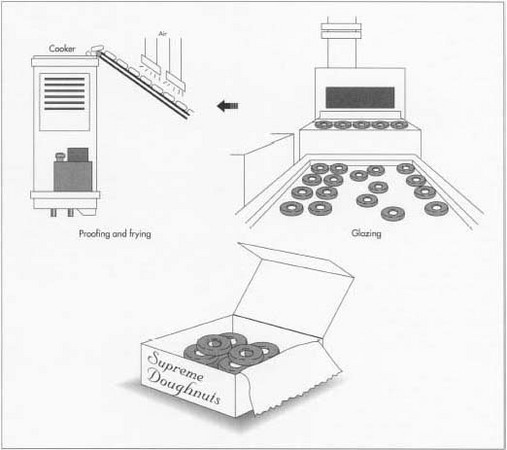 This process will describe the manufacture of doughnuts in a mechanized doughnut bakery that makes only yeast-raised doughnuts. Because yeast requires time for kneading, time to rest and additional time to rise or proof, it takes at least an hour to take dry pre-packaged mix to completed product. 1 Bakeries or franchises that do a brisk business (making hundreds of dozens in a day) acquire mixes in bags, often as large as 50 lb (22.7 kg). Chains have the ingredients shipped to them from company warehouses within the region and the mixes are stored on the premises and used as needed. The bakery must shop for large quantities of perishable fresh ingredients such as eggs and milk and keep them refrigerated. 2 A batch is referred to by weight of dry ingredients put into the mixture. The weight of the batch varies with doughnut type and amount to be made. The pre-packaged mix is poured from a bag onto a scale and the precise amount measured. 3 The flour mixture is then poured into a large mixing bowl put onto an industrial mixer and the appropriate amount of wet ingredients are added depending on weight of the batch and type of doughnut in production. The wet yeast slurry (for leavening) is mixed separately and carefully added to the flour-water mixture at this time. The dough mixer then begins its work; a large dough hook first mixes and then simulates the human kneading process, pulling and stretching, as it homogenizes the ingredients and develops the dough by forming the gluten into elongated and interlace fibers that form the basic structure of the doughnut. The mix runs on an automatic timer and the entire mixture, including the softened yeast, is kneaded together for approximately 13 minutes. 4 It is essential that yeast dough "rests" or simply sits for about 10 minutes after it is mechanically kneaded. As the yeast grows, it converts its food into carbon dioxide (this is called fermentation) and causes the yeast dough to rise. As the dough sits, it allows the gas to develop and the dough starts to rise, indicating the fermentation process of the yeast reacting to sugar in the mix is beginning. If this does not happen, the dough yields flat, tough doughnuts and the mix should be discarded. At the end of this period, a good-quality dough is spongy and soft. The premeasured flour mixture is mixed with the appropriate amount of wet ingredients The wet yeast slurry (for leavening) is mixed separately and carefully added to the flour-water mixture. Next, a large dough hook first mixes and then simulates the human kneading process, pulling and stretching, as it homogenizes the ingredients and develops the dough by forming the gluten into elongated and interlace fibers that form the basic structure of the doughnut. Once the yeast has had time to rise, the dough is loaded into a hopper that feeds the dough through an extruder. A cover is then placed on the machine and the machine is pressurized, forcing the dough into tubes that 'plop" out a pre-determined amount of dough into the desired shape—rings for conventional doughnuts and circles for doughnuts that are to be filled with jam or creme. system. The batch of yeast dough is put into the top of the open machine. A cover is then placed on the machine and the machine is pressurized, forcing the dough into tubes that extrude a pre-determined amount of dough into the desired shape—rings for conventional doughnuts and circles for doughnuts that are to be filled with jam or creme. It takes about 15 minutes for the extruder to push out about 30 dozen doughnuts. An automated doughnut stamper can also be used in conjunction with an extruder. 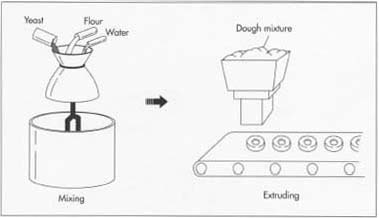 In this case, the dough is extruded in a continuous, unshaped flow through a series of rollers that flatten the dough. Once flattened to 0.5 in (1.27 cm) thickness, the sheet of dough is stamped into doughnut shapes. 6 The extruder is attached directly to the proofing box (a warm, oven-like machine), which is a hot-air, temperature-controlled warm box set to approximately 125° F (51.6° C). Here, the thin doughnuts are slowly allowed to rise or proof as the yeast ferments under controlled conditions. Proofing renders the doughnuts light and airy. (Yeast doughs must be allowed to rise slowly and at just the right temperature. If the proofing box is too hot, the yeast bacteria will be killed and the doughnuts will not rise. If too cold, the yeast remains inactive and cannot ferment thus preventing leavening. A machine attached to the extruder pushes the rings or circles onto small shelves that move through the proof box for about 30 minutes. The shelves are chain-driven and move down, up, and over during this 30 minute period. After 30 minutes, they are quite puffy. 7 Next, the raw doughnuts fall automatically, one row at a time, into the attached open fryer. It is important to drop just a certain amount of raw doughnuts into the grease at a time. If too many are placed in the fryer at one time, the oil temperature is drastically lowered, fry time is longer, and the doughnuts absorb too much oil. The frying oil is the most expensive ingredient in the production process, and if the doughnuts absorb too much oil, it reduces the profit margin on the batch. As the doughnuts move through the fryer, they are flipped over by a mechanism. After two minutes, the doughnuts have moved completely through the fryer and are forced into the mechanism that applies glaze. 8 As the doughnuts leave the fryer, they move under a shower of glaze. Here, glaze is forced through holes from a bridge running several inches above the hot doughnuts. The glaze coats the top, sides, and part of the bottom of the doughnuts. The doughnuts are conveyored out of the production area to dry and cool. The raw doughnuts are conveyored to the proofing box, a warm, oven-like machine that slowly allows the doughnuts to rise or proof as the yeast ferments under controlled conditions. Proofing renders the doughnuts light and airy. After proofing, the raw doughnuts fall automatically, one row at a time, into the attached open fryer. It takes two minutes for a doughnut to move through the fryer. Next, the doughnuts move under a shower of glaze. The doughnuts are conveyored out of the production area to dry and cool. 9 Once conveyored to a finishing station, the doughnuts may be sprinkled with candies or nuts or are given a thicker frosting. The disk-like doughnuts (those with no hole) are forced onto a machine that injects two doughnuts at a time with the desired, pre-measured filling. The completed doughnuts are placed on trays for movement to the counter or packed into boxes for custom orders. Packaged dry mix is made to specifications and checked at the processing plant. Perishables must be purchased fresh and quickly used. The yeast brew must be precisely mixed and used within 12 hours. It is essential for employees to carefully monitor all intervals of time for kneading, resting, proofing, and frying. Temperatures for proofing, baking, and frying machinery, liquid ingredients, and the production room are carefully monitored and maintained. Particularly important is adding the right temperature of water to the yeast brew and pre-packaged mix so the yeast is not inhibited or killed. The proofer must be precisely set at the right temperature—not too hot but warm enough to activate the yeast—or the yeast will be killed and the doughnuts will not rise. The fryer temperature is carefully determined so that the doughnuts will not absorb too much oil and be greasy. Employees must watch the ambient room temperature very carefully. If it is too hot in the room, it affects the rising of the yeast and may require re-calibration of the temperature of other machinery. Finally, employees' senses tell them much about the quality of the dough. They can tell by the feel of the dough after it is mixed if the dough is spongy and the yeast is rising properly. Watching the doughnuts plump up in the proofer indicates the temperature is just right. They watch for the appropriate color of the frying doughnuts to ensure they're not overcooked. Occasionally, the manager may pull a doughnut off the drying conveyor and pull it apart to see if it is too greasy. Using the extruding device that simultaneously cuts the dough into individual doughnut shapes, alleviates much of the dough waste. The stamping mechanism leaves excess dough, but that dough can be re-mixed into the next batch. Fischer, Paul. "It's Time to Praise the Doughnuts." Boston Magazine (May 1991): 66. Rombauer, Irma S. The Joy of Cooking. New York: The Bobbs-Merrill Co., Inc., 1953. Taylor, David A. "Ring King." Smithsonian Magazine (March 1998). great and did like your site learn how to make a Doughnuts very helpful. If you work in factory making a doughnuts how to run your line if you are a supervisor and make it better and came up with a good ideas ,and how to make a changes in your department. meaning to make you a good leader and be proud what you are doing.